Workouts with drumsticks are all the rage! Taking a fitness or cardio aerobics class that incorporates drumsticks? We've got weighted drumsticks with comfort grips! Do you own a studio and want competitive pricing on exercise drumsticks? We have bulk packages available. Have fun drumming to the beat while shedding those pounds! 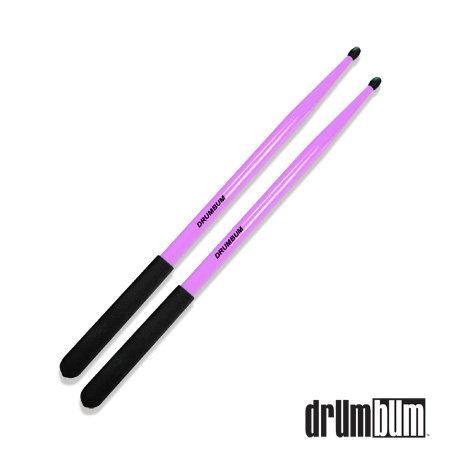 These stylish, pink drumsticks feature comfortable grips to make holding on to them that much easier. Featuring a thick, sturdy composition and the popular 'Drum Bum' brand. Quality hickory wood. You no longer need to know where to buy the best quality drumsticks on the market for your aerobics fitness drumming program. Drum Bum is the place! We have a 19 year reputation for excellence. Need to buy in bulk? Give us a call! - 1 800 DRUMBUM. industry. Top quality hickory wood designed for durabilty. Don't buy the cheap, lighter weight stix as they can splinter and even break during your drum workout routine. We offer quality, strong and reliable exercise drumsticks so you can concentrate on getting fit and not worrying about the saftey of your workout accessories. Need assistance with fitness drumsticks? These weighted cardio drumsticks are just the ticket for high energy drum workouts! They are the most durable workout drumsticks on the market for aerobics and fitness drumming programs. Made of a super-rigid polymer, they're thick and weigh approximately 3.1 oz each. The rubber handles are the best part, enabling you to firmly grip the sticks while concentrating on your steps and your drum exercise form. Try a pair out today! 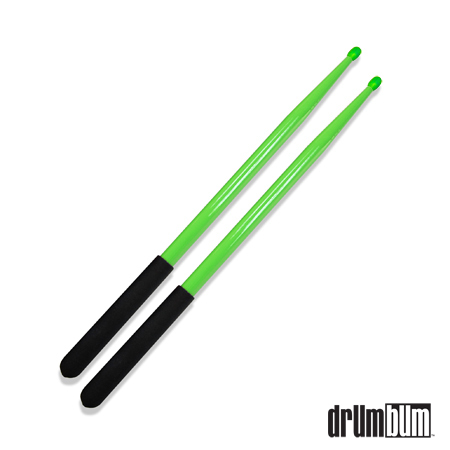 Green, Weighted Drumsticks - 4.4 oz. The heaviest fitness drumsticks on the market! If you want a little extra weight in each stick to help build muscle tone during your drumming workouts, these are the sticks for you! Each drumsticks weighs approx. 4.4 oz and these babies are built solid! From the thick, comfortable grips to the strong synthetic polymer, these drumsticks are built to last. Forget the cheap, China rip-offs. Go with American made quality cardio and fitness drumsticks. - Drum Bum! Unless you've had your head under a rock, you've probably heard about the new fitness craze, exercising with weighted drumsticks. In the last number of years, there have been several fitness programs rise up that incorporate drumming into their cardio workout routines. Usually there is an aerobic element and members drive up their heartbeats by pounding out rhythms while working out through cardio training. The music is pumping and while keeping in shape is the goal, the overall objective is to also have fun while doing it. It's not just pilates nor is it just an aerobic workout - it's a form of recreational drumming that just happens to really be good for you! Where there was only one choice of weighted, exercise sticks on the market, now there are weighted drumsticks with comfortable grips so they're easier to hold onto while exercising. That's right folks, our drumbum drumsticks for the gym have handles! And they're soft too! See our new pink, designer drumsticks. Workout in style! The leader in Unique Music Gifts and Drummer Accessories. Drum Bum, Inc leads the way with unique products, innovative ideas and advanced marketing. Since 1999, we've supplied the drumming industry with the best in retail gifts, promotional products and access to advertising on our popular drum network. Among our customers are some very recognizable names including Hard Rock Cafe, Blue Man Group and HBO. You might even have seen our products in movies like the brass music stands in Ted 2 or our cymbal monkeys in Final Destination 3. We are proud to offer unique, quality products and 100% first class service. There is a reason we have been in business for 19 years. Our customers appreciate being made to feel very special and they know our we set the bar high. Don't settle for cheaply made China fitness and cardio stix like fitstix or fitness rockstar drumsticks. Our products are American made and the quality stands out above the crowd! Put them back to back and you won't believe the difference! Yet drumbum prices are still cheap comparitively! Please don't hesitate to contact us if you have any questions about drumming or music products. Whether it be a small one time order or a bulk order of several hundred products, we've got you covered. - Stay tuned. We have more colors and models on the way! 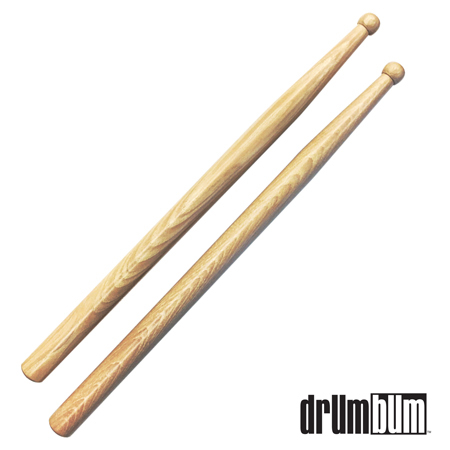 Fitness Drumsticks are available in different sizes, tips, and finishes. Call for more detail. Exercise with Drumsticks! It's all the new rage. It's a new fitness craze with drumsticks! Pound out your frustrations while losing weight and getting in shape. Numerous fitness programs across the US are now incorporating cardio drumsticks into their cardio fitness programs. They've found that this new fad brings a unique approach to working out while keeping the 'fun' element involved. Drumstick exercise classes have evolved incorporating Pilates -like routines where you either beat the sticks on a ball or on the floor or clicking them together all the while moving to the beat and shedding pounds. If you haven't tried a drumsticks workout, you're truly missing out! Getting ripped while drumming to music is definitely a better way to workou! Search your local directories or the net for drumstick exercise classes put some more fun into your workouts. If you need exercise drumsticks, contact us at 1-800-DRUM BUM. There are hundreds of drumsticks on the market for drummers but it's only been recent that drumming has entered the cardio fitness arena. Where percussive sticks come in various sizes and shapes, drumsticks for exercise classes require more weight in each stick so that it contributes to muscle tone. 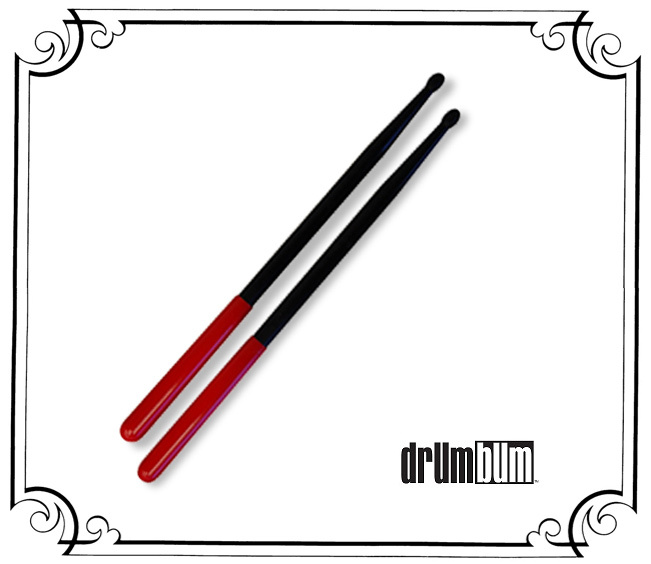 DRUM BUM offers not only that extra weight but firm, comfortable grips (drumsticks with handles!) that make it easier to hold the stick while working out. Buy your cardio drumming supplies with us! Don't rip up that gym contract just yet. If they have a drumming fitness program or cardio drumming class, you'll now have more fun exercising and losing weight than ever before! Get a full body workout with aerobic exercise and toning through weighted drumsticks and a high-intesity fitness routine. Drumming is now the new craze in fitness and Drum Bum has your sticks. Don't be left out! We have had requests for plain, large, thick, heavy wooden drumsticks at a lower price. We listened and you can find them in our store as well. Not everyone has the budget for the fancy, colorful, weighted stix so we now have an alternative. In a drumsticks class? Or maybe you have the drumstick exercise video at home. Rock out to your favorite music while drumming to the beat and pounding off those calories! Working out with drumsticks is a blast! Need More Information on our Drum Sticks or Supplies? Workout and Get Ripped with Weighted Stix! What else is new. Well, we now have purple fitness drumsticks (actually more of a lavender color). We also have the ability to brand your studio name on the sticks for a minimum order amount. Call us for more information. If you have a studio that incorporates a drumming workout exercise program like cardio fitness or strength building classes related to drumming aerobics, you're going to need drumsticks. If you need weighted drumsticks and would love to have our unique comfort grips (handles), visit Drum Bum today. Get fit with your drum workout but do it safely and conveniently with the highest quality exercise drumsticks on the market - DRUM BUM exercise drumsticks. Also, you can now order our branded pink or purple sticks with your own company on them or catch phrase. Perhaps "Get Fit", "Drumming Up Fitness" or "Cardio Drummer" would make catchy phrases. The minimum for custom orders is 144 pair. Call us about drumsticks or cardio drumming supplies at 1-804-273-1353 for more details.